Remember the beautiful Poppy Floral scarf I wore throughout the sweet little cities of France last year? Well Therapy Threads has come out with another lovely line of basic organic scarves and jewelry, too! Just to refresh our memories, aromatherapy is the practice of using natural oils to better your health. Therapy Threads is taking this practice and combining it with accessories, like scarves and bracelets, so you are able to experience a sense of calming throughout your busy day. Promotes Self-Care & Mental Wellness: These two things can easily slip by us when we are constantly on the go or juggle multiple tasks. We become so caught up in life and bad habits that self-care can sometimes be put on the back burner. We have to incorporate it into our daily lives. I’ve noticed a huge difference in my own mental wellness when I put forth effort into self-care. Especially for those who are in the process of healing or going through big life changes, aromatherapy can bring much comfort. 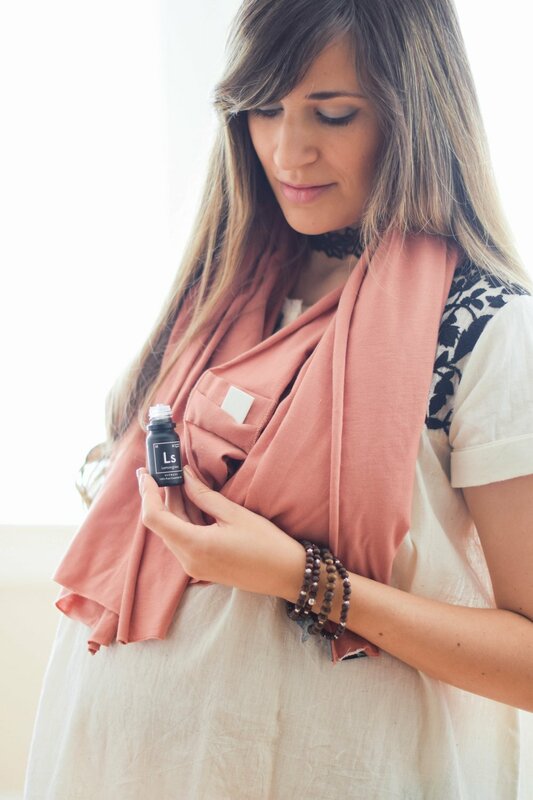 Dani Singer, the creator, feels we can offer an obtainable, natural alternative to support healing by bringing fashion and aromatherapy together. I've noticed within my life and dealing with a high-risk pregnancy I've really had to take a step back and focus on my own well being. It's definitely been one of the most vulnerable times in my life, and having 'natural' ways of dealing with stress and change have been very important to me. Organic Cotton: The coral scarf I’m wearing here is made with 100% organic cotton, and is an ideal weight for this time of year. It’s very soft and an awesome travel buddy, as well. It’s impossible to escape the blazing AC in Florida, so I’m one of those with a scarf allows in tow! Plus, the color palette they chose is full of great neutrals for any wardrobe. Essential Oils: You can choose from over 15 different essential oils to use on the aroma pads and bracelets. Their scents linger throughout the day, and there is something for everyone. Giving Back: Dani has several years of experience with treating families, couples & PTSD patients, and is a survivor of sexual abuse, bullying and domestic violence. Therapy Threads, represents two things: 1) Dani's passion in providing mental health therapy & 2) The several threads that come together to make healing and wellness possible. With 1 in 5 adults suffering from mental illness in the U.S. the discussion is not loud enough! 10% of proceeds are donated to the National Alliance on Mental Illness. You can even join the Self Care Club Dani has put together! Coral Organic Aromatherapy Diffuser Scarf: Made from 100% organic cotton, this scarf has a little pouch on the inside to secure your aroma pad. It's a gorgeous color, and like I mentioned before, very soft and great to have on hand everyday! Essential Oil+Aroma-Diffuser Bracelet Bundle: This wonderful meditation bundle combines the healing properties of both aromatherapy and quartz crystal stones. These stones help clear your mind of negative energy - enhance personal growth - provide spiritual healing - may improve circulation, immune system, and metabolism with enhanced energy flow and improved balance - and alleviates exhaustion and offers increased energy levels! I love how they are paired with the wood beads, too. Aroma Pads: These are the little guys you can easily insert into the pouch on in the scarf. They are reusable and you can layer the oils on day-to-day OR you can always keep them separate if you prefer not to mix! You can find their entire collection online - here - & use code CHIC15 for 15% off your entire purchase!! Plus, shipping is free for orders over $25. Thanks for stopping by! I'm happy you're interested in sustainable fashion. It's been a big part of my life for 7 years, and especially the last 5 years with Sustainably Chic. I hope you find this space useful and full of great information on brands who care about their impact on the earth and its people. Sign up with your email address to receive news and updates about sustainable fashion, green beauty & eco lifestyle every Saturday!